Don your masks for a night full of food, drinks, and dancing!! Cocktail attire and masks encouraged!! *All attendees must be 21 years of age or older. Be part of this unique experience and join three local artists for a live event painting at the 2016 Masquerade Ball. Artists will recreate real-time interpretations of the event and paintings produces will be auctioned off. Half of the proceeds will benefit Junior League of Annapolis, Inc. This event is brought to you by Joann Vaughn, Maryland Federation of Art Executive Director and current JLA Sustainer Member. Capture the memories and see it unfold at the event! Thank you to the following participating restaurants for donating their services and culinary cuisine to our event! 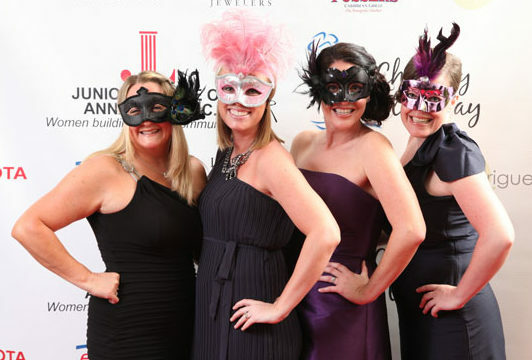 At this year’s Annual Charity Gala, attendees are encouraged to wear a masquerade mask. Community support of JLA continues to aid in keeping our organization accessible and enriches the lives of women and children in Anne Arundel County. The Annual Gala serves as an integral source of funding to help further the Junior League’s mission of community outreach and volunteer initiatives. The Gala event will take lead in the fundraising events for JLA this year. This evening soiree is dubbed as a favorite event among members. The night is full of live entertainment, dancing, auction, hors d’oeuvre plates from local restaurants and much more!